Five palaces for P440?! YES. Have you been to the country that gave us Gong Yoo? Because you totally need to make the trip. Apart from gorgeous men, South Korea is rich in history, style, and out-of-this-world eats! And no, you won’t have to take out a loan just to enjoy what they have to offer. All you need are these budget hacks! 1. Have you ever heard of temple stays? Apart from hostels—something South Korea has a lot of—you can also try a temple stay for a unique experience. It allows you to experience the daily lifestyle and rituals of Korean Buddhists. You’ll also be exposed to “traditional culture, rural village exploration, hiking, and ecology.” Depending on how many nights you stay, a temple stay can cost anywhere from 30,000 won (P1,300) to 100,000 won (P4,500). If, however, you’re still partial to hostels, most of the hostels charge P600 on average. 2. Get the T-Money card. 3. Palace hopping? Invest in the integrated pass. This pass will give you access to five major attractions in Seoul, namely the four main palaces—Gyeongbokgung, Changdeokgung, Changgyeonggung, and Deoksugung—and Jongmyo Shrine. Without the pass, you'd spend 14,000 won (P615) on all five attractions, but with the pass, you can visit everything for just 10,000 won (P440). Every saving matters! Ok, maybe avoid is a strong word. 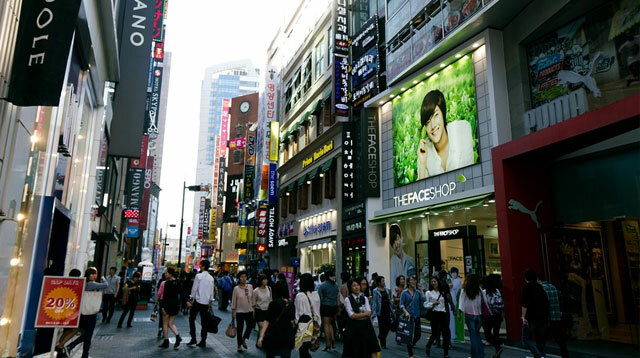 Who can really resist the urge to shop in Garosu-gil's cute boutiques or Myeong-dong's maze of beauty shops? But if you want cheaper finds, try Korea’s underground malls! They have tops for less than P200! These malls are near train stations, and they’re a perfect reprieve for when you want to escape a rain storm, but still have enough energy to continue shopping. Streats = street eats. Street food in Korea is affordable and delicious. And we don’t just mean delicious for street food either. One couple documented their street food finds in Korea, and we’re so impressed! Popcorn chicken with rice cake for P200? Egg muffin for P90? French fry-coated hot dog for P110? Gimbap for P90? All of the above!